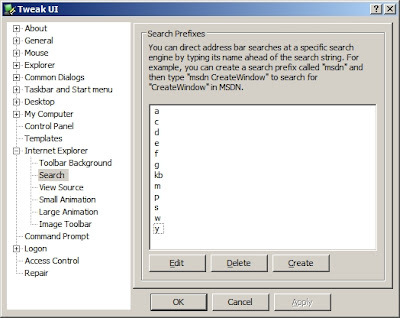 TweakUI has a nice handy feature of creating Internet Explorer search shortcuts. So, instead of opening www.google.com first and then typing the search string, TweakUI lets you assign a search prefix (e.g. “g”) to Google’s search URL. You can then type “g searchstring” directly in IE’s address bar to search for “searchstring” using Google search. For example, Google’s search URL for the search string “ipod” is http://www.google.com/search?hl=en&q=ipod. To create a shortcut for this search URL, copy-paste it in TweakUI window and replace the search string “ipod” with “%s” (http://www.google.com/search?hl=en&q=%s). You can create search shortcuts not only for Search engines, but for any site which offers search functionality by observing their search URLs in the address bar. Below are some of the search shortcuts that I use for some common sites. Shortcut Search URL What for? After you have created these shortcuts, you can export the relevant registry key as a backup or to import that to any other computer. These shortcuts are located at HKEY_CURRENT_USER\Software\Microsoft\Internet Explorer\SearchURL. Export this key into a .REG file and import it on any other computer. These shortcuts work with IE7 as well. Here is the .REG file with above shortcuts. If you are geeky enough, you can add/modify entries in your registry even without TweakUI! Want a customised list of shortcuts for yourself? Let me know the websites you frequently access!